The future is very bright on this campus, can’t wait to see what else is in store. 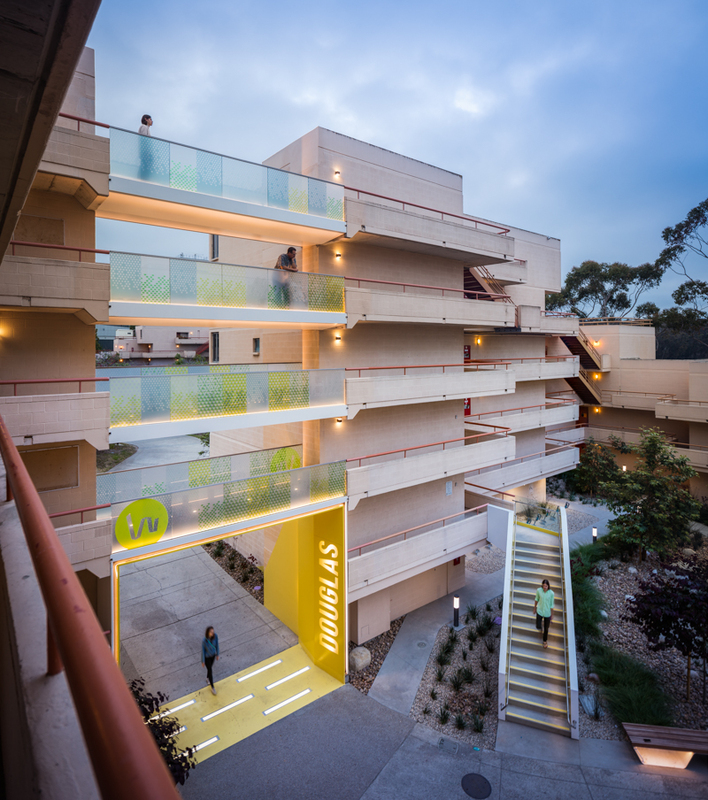 Douglas Hall and its 3 identical sister buildings at UC San Diego epitomize the repetitive, institutional, and aging soulless student housing found on many university campus’ that simply lack any “there”, there. So when a stack of concrete bridges spanning over the main pedestrian/bike path connecting this residence hall to the main campus became structurally compromised, the University seized the opportunity to implement this modest initial refresh as a test case for some exciting new ideas to be implemented as part of the entire Warren College residential neighborhood update already on the books. As a counterpoint to the boxy, beige, and boring six story structure they serve, the replacement bridges and associated landscaped courtyard were reimagined to address the shortcomings of the original tired design, specifically the physical constriction (only 7′-4″ of clearance beneath the bottom bridge), lack of identity, non-existent exterior social spaces, and very poor nighttime lighting a significant safety issue for students coming home at night. The first move was to literally and figuratively open things up and improve sight lines. 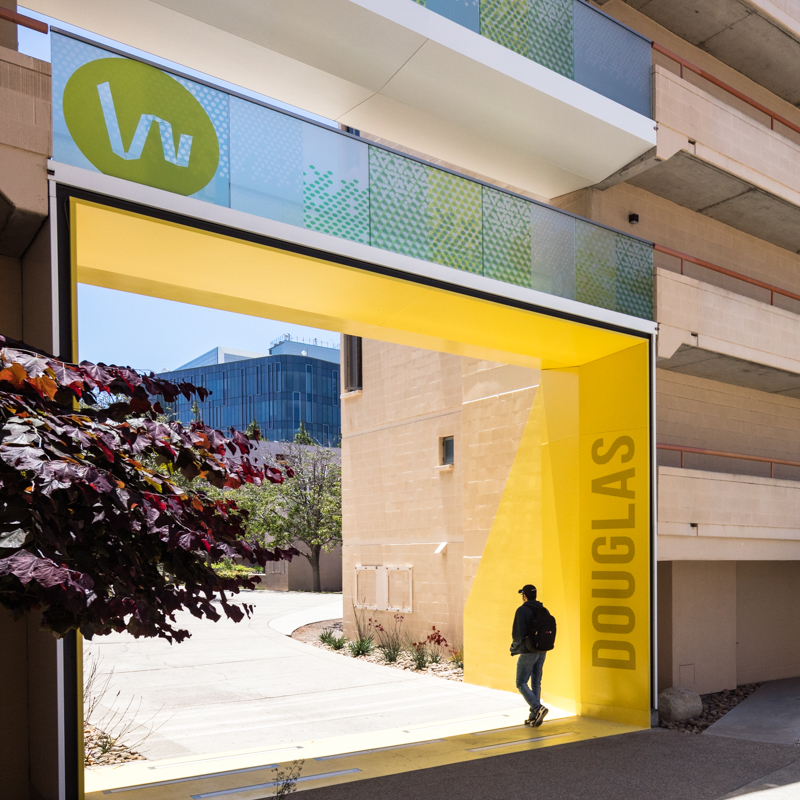 A vibrant yellow double height portal was created by eliminating the bottom bridge altogether and adding a new access stair. To establish identity, the res hall’s namesake (Supreme Court Justice John Douglas) was perforated into the portal side wall along with one of his inspirational quotes. Speaking to the dynamic and diverse youth culture on campus, the design language is intentionally modern, engaging, and transparent. Place-making is addressed in a material palette that includes natural Ipe wood decking, colorfully abstract glass guardrails, a crisp white metal skin, and individual seats added to each level encourage residents to stop for a moment in transit to enjoy the views or a conversation. Once sketchy and foreboding after dark, the bridges, path, and courtyard are completely transformed by an integrated and thoughtful lighting design into something quite extraordinary once the sun sets. Douglas Hall is now easily distinguishable from its 3 drab neighbors. 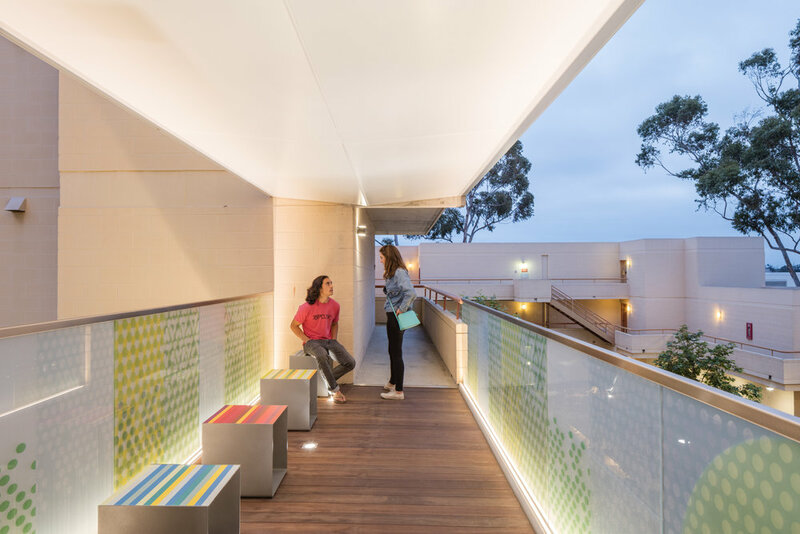 It is exciting to see the old school dorm model being completely refashioned into dynamic student living environments designed to foster community generating the same excitement as the world class academic education UC San Diego offers. The future is very bright on this campus, can’t wait to see what else is in store as the place continues to evolve, grow, and mature!